Fully upholstered in Black Leatherplus. 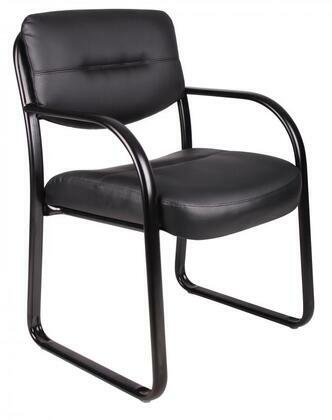 Polished tubular steel frame coated with Black scratch resistant finish. Thick contoured cushions for added comfort support. Moves smoothly over hard surface ad plush carpeting. Curved arms easily clear front edges when pulled close to table. Contoured seat and back provides firm lumbar support.